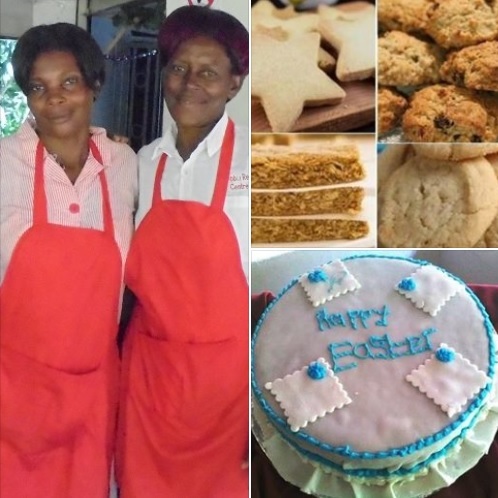 Home » T’OVEN’S ON – HADIJAH & JOSEPHINE AWAIT YOUR ORDER FOR THE KABUBBU KITCHEN! Can the Kabubbu Kitchen meet the Easter cake bake challenge?! Yes, Easter is around the corner 19th – 21st April and the oven’s on! Doreen & team’s Christmas bake stretched to over 100 cakes – can we keep them busy for Easter?!? Buy a cake or biscuits – or even an Easter chicken – for the family of your Kabubbu Kid. Deadline 18th April. We’ll make sure your order reaches the Kabubbu Resort Centre kitchen on Thursday.